At 6 a.m., I dragged myself from the depths of slumber to the sound of Daddy calling my name. "Girls, it's time to get up!". I will admit that I was very tired and that I rather wasted my morning instead of pushing myself to get a move on the day. As it takes me awhile to write something, a lot of time went into writing yesterday's post. 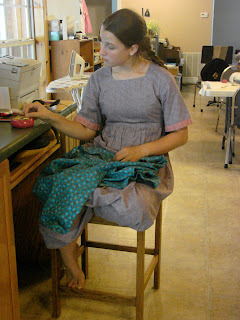 I'm wearing a dress that Anna made me for my fifteenth birthday, as well as a matching one for herself. It's one of my favorite dresses! 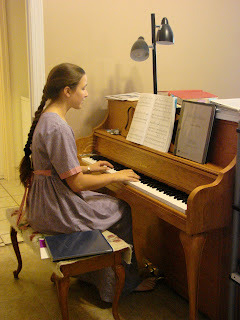 I also got my piano practice done, but didn't get to my flute. Definitely one of those sluggish days. I decided that I was at least going to get some schoolwork done, so I pulled my history books out and sat down to read. I really enjoy reading about history, in textbooks, nonfiction and historical novels (if it's accurate). 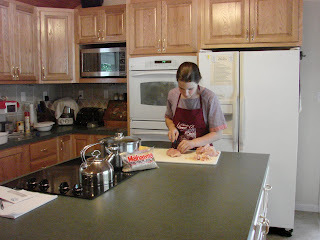 Mother asked me to cut some chicken for supper, so I began to do that. I mixed Cream of Chicken with rosemary seasoning and poured it over the chicken. We baked it in the oven and ate it over brown rice. It was quite good! 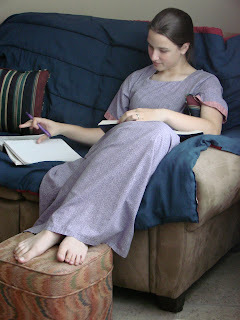 After supper, I went upstairs and finished the waist on my culottes and came downstairs to finish getting Esther's ready. Elijah, you are too funny. Hope you are having fun at JAARS! That's a nice dress.Is it a Regency style one? I can relate to taking time to write a post/article. Will you be taking a break from school during the summer? Actually, I'm pretty much taking a break from school now, but I'm doing a couple of books over the summer when I have the time. Yes, I love this dress too. Anna and I always have fun wearing ours together. Her dress matches mine, except hers colors are switched around. Glad you're enjoying the dress! 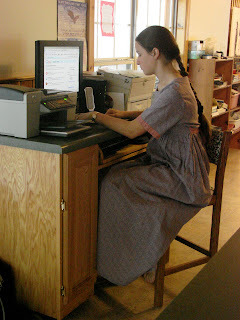 Actually, the pattern isn't from Sense and Sensibility patterns, it's from Common Sense Patterns (http://www.commonsensepatterns.com/csp_main.htm) their Square Neck Dress.